Over the years, I have picked up a few of Mega Miniature's models from ebay or the online store. The nostalgia value of their line is high for me, reissuing many figures from my D & D days in the 80s. While primarily catering to the role player, many of their townspeople and animals add character and possibilities to a skirmish scenario. Sadly, the business will be no more by the end of the year. As of May 31st, the molds are in the process of being sold off, and the store is set to close at the end of the year. Hopefully most of the line will find homes elsewhere, but in how many different stores or sites? Last year, I purchased a number of dancers and servants from Mega Mini's "Arabian Fantasy" line to use as background for my Spain campaigns. I had the idea to build a small emir's palace for El Cid to lay siege. All I have completed so far are the walls and this small plaza. It is made from foam board, craft store tiles and Hirst Art blocks. 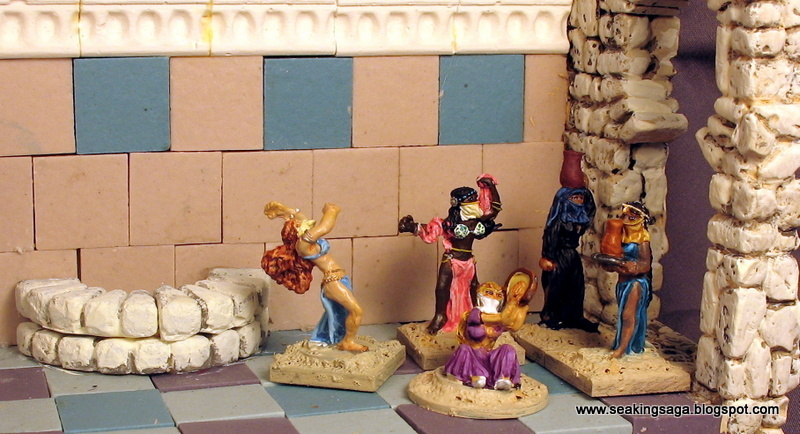 The dancers and serving girls below are typical of the Mega Mini's line. On the short side of the 28mm scale, but not quite as small as a true 25mm, they also lack the sharp detail of most modern productions. As a comparison, the dancer in green in the photo above is a metal Reaper figure. The Reaper figure is excellent - sharp, nicely proportioned. It's not without its faults, though - look at those man hands! Speaking of Reaper, the Reaper Bones Kickstarter may have been the writing on the wall for Mega Minis and other producers of inexpensive metals. Converting a line of high quality metals into inexpensive plastics will dramatically change the RPG miniature market, if a $3 million dollar Kickstarter is any indication. While it will probably have little effect on the historical wargaming market in the short term, the market will probably push many manufacturers to go plastic on even more of their lines and cancel models or whole periods that are not worth the conversion costs.